Home » Specialty Appliances » Water Purifiers » What is the Best Water Filter Pitcher in 2018? Clear, cool water is the elixir of life and you want to be sure that you are drinking the purest water possible. You can when using the best water filter pitcher you can buy. Designed to filter and store your water with easy to use filtration systems, these pitchers filter gallons of water per replaceable filter. You’ll have cup after cup of clear, cool, pollutant free water while knowing that you save money and the environment by not buying bottled water. Choose your pitcher by size, design, ease of use and filtering ability. If you normally like cold water, the pitcher will have to fit in your refrigerator. However, getting a small pitcher for a large family creates unnecessary extra work. Check to see how often you need to change the filter and whether it has an indicator that will tell you when to change it. Ensure that the water filter pitcher ratings indicate which contaminants are filtered out. All filter pitchers reduce chlorine. In addition, some can reduce pharmaceutical traces, heavy metals, microbial cysts and industrial and agricultural contaminants. If you live in a hard water area and you don’t have a main water softener installed at the main supply inlet, then at least your drinking water should be filtered of those hard water compounds. If you boil water for tea or coffee, your kettle will thank you for it. Otherwise, you’d have to get an electric kettle that includes a scale filter. Also make sure that the pitcher is BPA-free. Lastly, since the filters do have to be replaced now and then, to get the best value per gallon of water, check to see how often that needs to happen and what the cost of each pitcher’s filter is. In addition to the following best water filter pitchers, there are several more available on Amazon. One thing that water filtration does not do is remove all inorganic impurities. These are what cause water to be hard. Some level of hardness is good but if you think that the tap water you get is too hard, you could use a water distiller and just add the essential minerals your body needs back in. One thing to note is that all these pitchers use filters that need replacing after several filtrations. If you’re someone that finds the task of keeping track and running out to buy a replacement quite a chore, consider getting the Brita Infinity Smart Water Pitcher that automatically orders one for you when the time comes using the Amazon Dash Replenishment system. Although we pick the following as the best, many customers often ask about 3 very popular brands of pitcher filters. That’s why we do a separate comparison of the Brita, Pur and Zero Water filter pitchers. The MAVEA water filter gives you 72 ounces or 9 glasses of filtered water per fill. Water with a minimized chlorine taste and odor and a reduction of organic contaminants, heavy metals, pesticides and hard water scales is the benefit of the MAVEA Elemaris. You will know that you and your family will be drinking the purest water possible while having a great looking pitcher on your countertop. It is available in while, black, purple, orange and red. One of the most technological advanced water filter pitchers on the market, the MAVEA Elemaris gives you 40 gallons of filtered water. The silver treated filter inhibits bacteria growth. The digital Smart Meter filter change indicator not only lets you know when to change the filter, it also lets you know the hardness and volume of water left, but also the length of time the filter has been in use. The shape of the filter case ensures a consistent level of filtration throughout its use. The self-opening and closing pour through lid makes filling the pitcher easy and mess free although a few users have said that this piece falls off at times while filling and when the top compartment overfills, water slowly leaks down the handle. The BPA-free plastic is durable and easy to clean and the rubberized feet prevent it from scratching your counters. The pitcher and reservoir can either be hand cleaned or put in the dishwasher. 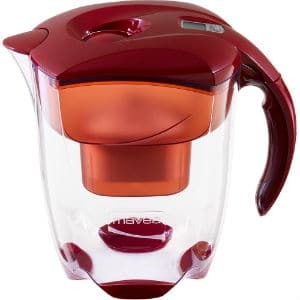 Users liked the fact that MAVEA uses BPA-free plastic; they also stated that the self-opening and closing lid works well and makes filling the pitcher easy. Several reviewers commented that this water filter pitcher does not leave deposits of charcoal in your water as some other filters do. This is because of the presence of a micro-screen in the filter. A basic but best-selling pitcher water filter, the Brita Everyday pitcher filters 40 gallons of water before filter replacement is necessary. Made with BPA-free plastic, the oval pitcher is easy to fill and easy to use. With no electronics on board, tracking water usage is done with the use of a date sticker. The Brita Everyday Filter is an inexpensive way to filter your water. For large families this Brita model is a good way to go. Using the same charcoal filtration of its more expensive sibling, the Everyday will give you gallons of clean, filtered water, inexpensively. Several customers have purchased this water filter pitcher to replace Brita products that they have had. This is a good testament to Brita’s products. Other reviewers where impressed with how fast it filters water. One complaint by a reviewer regarded the difficulty that they had replacing the filter on this pitcher. The smallest and best cheap water filter in this line-up is the PUR CR-4000. The feature that makes it the best is its ability to remove 99.9 percent of microbial cysts from your drinking water, the first leading water filter pitcher to do so. It is also certified to reduce the taste and odor of chlorine, removes hard water scales, 95% mercury and 96% trace pharmaceuticals, all while leaving beneficial fluorine intact. The lid is thumb activated for easy filling and the space saving design has a small footprint that fits easily in your refrigerator, giving you clean, cold fresh water when you want it. The patented sure fit filter of the PUR CR-4000 pitcher ensures separation of filtered and unfiltered water. It filters 40 gallons of water per filter and will last up to two months with normal use. Like the Brita, the PUR 5-cup water filter pitcher does not have an indicator light telling you when to change the filter, so you must track it by date, and usage. Some users were impressed by the amount of contaminants removed by the filter as compared to the Mavea and Brita. Another reviewer found the small size of the PUR to be convenient although it is probably a bit small for a family. A number of reviewers commented on the improved taste of their water when filtered through the PUR water filter pitcher and many say that they love it. A familiar name to nature lovers, CamelBak is a name that is synonymous with water storage and purification. The spill proof lid of the CamelBak locks and has a filter replacement dial. The 10-cup pitcher is made from BPA free Tritan and has a slim design so it can fit in most refrigerator doors. Dishwasher safe and easy to clean, the CamelBak Relay Pitcher comes with CamelBak’s “Got your Bak” lifetime guarantee. That’s hard to beat! Note that this filter pitcher is really only for removing bad taste and not for filtering out impurities or hard water scales. CamelBak’s Double Filter Technology and pleated filter makes filtering fast – as fast as pouring the water through. The Relay Fresh Filter is made with plant–based activated carbon embedded in a non-woven material to give you water with the taste and odor of chloramine and chlorine removed. One reviewer found that since this pitcher filters water so quickly, they found no need to keep it filled and filtered their water as needed. Several reviewers mentioned the taste of the water to be pleasing and like that there is a filter change dial that you can set to a future month. This is recommended as 4 months, but can change according to how often you refill. It must be noted that there are two filters – one is used while filling the pitcher and the other is used while pouring water out into your glass. This makes pouring a bit awkward and slower than you can do with other products. The 72-ounce BPA Free Clear2o water filter pitcher can filter 50 gallons of water and the unique filling system filters it fast. The Clear 2o is tested to reduce five times more contaminants than other filters because of its solid carbon block filtration system. It uses a simple indicator light system of green, yellow and red for letting you know when to change the filter. It measures water flow through the filter so this indicator is more accurate than most others. Using an adaptor, this water filter pitcher attaches to a standard faucet so you must make sure the adaptor will fit on yours. It can’t be used for spray taps and an extender hose is necessary to make it convenient to use without lifting the pitcher up to the faucet opening. This unique fill system enables you to quickly and conveniently fill your pitcher, giving you filter water almost immediately. A customer of the Clear 2o likes that it filters a pitcher of water in 60 seconds or less, compared to minutes in some other pitchers. Other reviewers commented on an improved taste of their water. If water contamination is your biggest concern, this is the best option because of its superior filtration system. However, many users find it tough to fix on their faucet.